Quartz crystals are easily identifiable by their hexagonal prisms, and most people have seen quartz in its natural crystal form. Quartz is probably the most common mineral on earth, comprising about xx5 of the earth's crust. Silica has a hardness of 7 on the Moh's scale, making it resistant to wear - both in nature and in jewelry which adorns the body. Quart comes in a variety of colors due to different mechanisms of color source - defects, trace elements, ......... For example, natural smoky quartz is the same composition as clear or white quartz, but there is a small amount of radiation damage causing the smoky color. This can happen naturally from small amounts of radiation in a rock over the rock's 'lifetime'....or it can be produced in the laboratory. 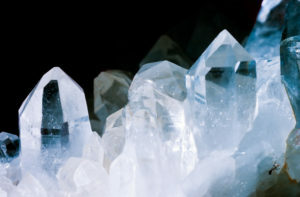 Arkansas is the US locality with large clusters of quartz crystals – both clear and smoky.